Today’s human services environment is a turbulent one, comprised as ever of numerous and complex challenges. It also remains an environment ripe for path-breaking innovation and transformation. Yet as leaders embrace the potential of emerging human services innovations, they come face-to-face with established institutions, business models, systems, and ways of measuring value that raise formidable barriers to adopting new methods. To help human services officials work through these challenges and set a strategy, the Technology and Entrepreneurship Center at Harvard, Leadership for a Networked World and Accenture, in collaboration with the American Public Human Services Association are convening senior-most leaders for The 2015 Human Services Summit: Emergent Leadership - Turning Ideas into Outcomes. 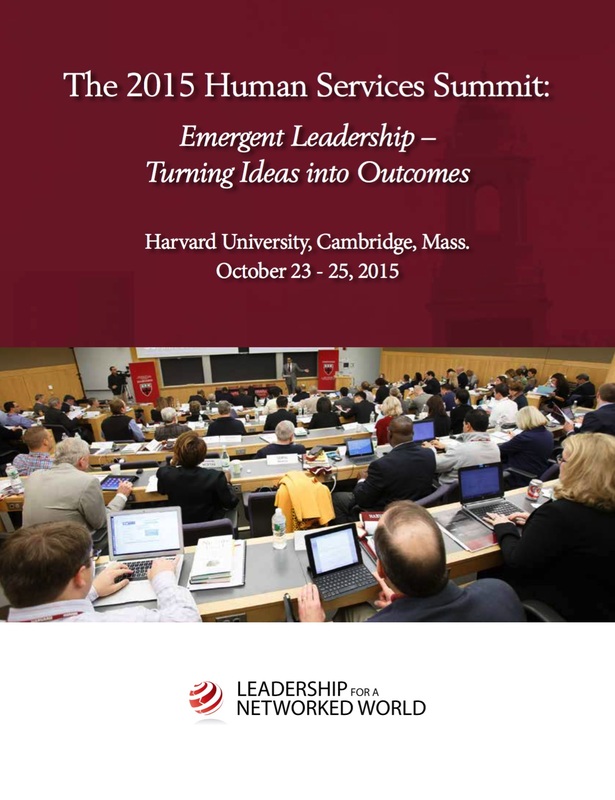 This sixth annual Summit, to be held October 23 – 25, 2015 at Harvard University in Cambridge, Mass., will provide an unparalleled opportunity to learn from and network with the world’s foremost human services practitioners, Harvard faculty and researchers and select industry experts. The Summit will feature practitioner case studies, ideation sessions and topical workshops designed to help participants lead their human services organizations up the Human Services Value Curve. Summit participants will gain membership to a community of peers and experts, and leave the Summit prepared and poised to capture emerging capacity, but also deliver new levels of outcomes and impact for society, communities, families and individuals. Challenging and uncertain times have always been a catalyst for looking at problems in novel ways, inventing fresh solutions, designing new organizations, and delivering better results and value. Now is no different. For leaders in health and human services, today’s challenges are bringing an unparalleled opportunity to create the future of outcomes and impact. Creating a better, brighter, and more impactful future will require developing new forms and new levels of outcomes for individuals, families, and communities. This form of change and innovation will increasingly require health and human services leaders to build a “generative ecosystem” – a set of interconnected organizations, machines, and services that can coproduce new solutions that address and solve the root causes of individual, family, and community health and human services challenges. What does the future of health and human services look like? Where can we see glimpses of the future? How will we scale up promising innovations to achieve our vision? Even with all the positive examples of progress and innovation in knitting together services, more work must be done to envision and build the ecosystem of organizations that can work together to design and deliver solutions that address the root causes of individual, family, and community health and human services challenges. The question of how to achieve the potential of new ideas and business models is critically important in human services, given the powerful emergence of innovations such as Pay-for-Success and Social Impact nancing, collective impact strategies, executive functioning science, evidence-based service design, two-generation interventions, and many more capacity-building and outcome-driving ideas. To help human services leaders acquire these skills and strategies, the Technology and Entrepreneurship Center at Harvard, Leadership for a Networked World and Accenture, in collaboration with the American Public Human Services Association, convened senior leaders for the 2015 Human Services Summit: Emergent Leadership – Turning Ideas into Outcomes. To move forward, human services leaders must examine and appreciate how the dynamics of convergence will play out now and in the future. Based on insights from previous summits and research, we can forecast greater alignment and new partnerships between health and human services, education, workforce, and public safety to create pathways to community well-being. To help leaders examine convergence dynamics and build capacity for the future, the Technology and Entrepreneurship Center at Harvard, Leadership for a Networked World, and Accenture, in collaboration with the American Public Human Services Association, hosted The 2014 Human Services Summit: The Dynamics of Convergence. This fifth annual Summit brought together the world’s foremost human services practitioners, industry experts, and Harvard faculty and researchers to explore these topics. When disruption is the new normal, what does leadership look like? Successful leaders see opportunities to respond in innovative ways, and disruption becomes a catalyst for better business models that guide individuals, families and communities to self-sufficiency. To harness and share these lessons, Leadership for a Networked World, Accenture, the Technology and Entrepreneurship Center at Harvard and the American Public Human Services Association convened human services leaders for The 2013 Human Services Summit: Leadership in an Era of Disruption. The fourth annual Summit, held at Harvard University in Cambridge, Mass., brought together the world’s premier human services practitioners, Harvard faculty, fellows, and researchers and select industry experts to explore these topics.